Paul Michel, the executive director of TRU Aboriginal Affairs, hosted an Indigenous drumming and storytelling session on March 13 in the BC Centre, House of Learning, as part of IDays 2019. Embracing this year’s theme: “Celebrating Culture, Diversity and Innovation”, Michel highlighted the importance of preserving the oral tradition of storytelling. “You know your greater knowledge and you help the students understand the readings in their textbooks and the formality? that’s oral history and that’s what will help within a classroom,” he said. Michel also shared a story about an Indigenous tribe who survived the 2004 Indian Ocean Tsunami because of storytelling. He stated that 100-percent of the tribe survived because of a story passed down to them from generations. He explained that the tribe were able to survive the Tsunami because they recognized the signs from their stories before the natural disaster hit. “They hit the highlands right away and the ones in the ocean saw the signs and they headed more towards the middle of the ocean because it’s only turbulent water,” Michel added. Sharing a story from his own Secwepemc heritage, Michel talked about how his father took him to Adam’s Lake and told him a traditional story after he had told his parents that he wanted to come home after finishing a two-year diploma. “As we were on the canoe and travelling on Adam’s Lake there was this rock and within it the water swirls,” he stated. 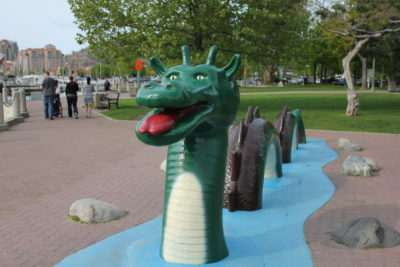 Michel said his father looked at him and asked him if he knew the story about Ogopogo or Loch Ness Monster. Michel explained that “the people that lived at the head of the lake” had trouble crossing it to get to the Cariboo and medicines because of Ogopogo. “The only way they could get around the lake (was) to either walk or paddle in the shallow parts, but it took a long time,” he stated. Michel said the people gathered everyone together at a dinner and the elders talked day and night until four warriors were selected to try and defeat the monster. While the first three warriors were unsuccessful, Michel said the fourth warrior was able to defeat Ogopogo after having visions where the old spirit animals guided him. Michel said the story made him ponder until he realized that the warriors represented different individuals in life and that he needed to be the fourth warrior. The session also featured Troy Thomas, an Indigenous mentor from House 5 who shared the tale of how Brother Coyote and Brother Bear made day and night.